On September 14th Swedish voters went to the polls. After two consecutive terms of centre-right rule, the centre-left, led by the Social Democrats, looks set to regain office. Although the government-formation process continues, at the time of writing it seems likely that the Social Democrats and the Greens will form a minority coalition. However, their win is anything but unequivocal. Not only were the electoral results of the centre-left parties rather modest; the post-election parliamentary situation provides the likely new prime minister, Stefan Löfven, with serious challenges. First, the seats of the centre-left combined do not add up to a majority. Second, the huge success of the anti-immigration Sweden Democrats means that customary patterns of co-operation between the established parties are not enough to produce an effective and stable government. The results of the election were largely expected (see Table 1). Numerous opinion polls during the campaign had rather accurately predicted what could best be described as an election with one winner and seven losers. All four parties of the incumbent government lost ground. The prime minister’s party, the Moderates, lost about 7% of their voters. Still, while this is, of course, a major setback for the party, a share of 23% is a decent result for the party in a historical perspective. In fact, the situation might now be more acute for the Moderates’ junior coalition partners. The Christian Democrats lost vote share for a fourth consecutive election. For the third election in a row, the Liberals failed to increase their support. Finally, the Centre Party also endured its second straight election loss. However, the centre-left did not do well either. Although the Social Democrats gained 0.4%, the result was far below their publicly declared goal of 35%. With 31%, the party actually suffered its second-worst result ever, surpassing only its score in of 2010. Neither could the Left Party profit from the general decline amongst the parties of government; it only marginally increased its score. Most surprisingly, the Greens also lost ground. The party had consistently scored around 10% in opinion polls during the previous couple of years and, moreover, they had done sensationally well in the EU elections earlier in 2014, when their 15.4% made them the second-largest party, behind the Social Democrats. All told, then, the election was more a defeat for the centre-right than a win for the centre-left. The fact is that the centre-left parties combined did not improve on their 2010 result. While all the established parties have reasons to be disappointed, there was one big winner. With almost 13%, the anti-immigration Sweden Democrats more than doubled their share and are now comfortably the third biggest party in Sweden. In terms of radical right party success, Sweden was long considered a deviant case (Dahlström & Esaiasson 2013). However, after the Sweden Democrats’ breakthrough into parliament in 2010, and now this massive electoral upswing, Sweden now conforms well to established West European patterns. So why did it turn out the way it did? While voting patterns in European elections usually deviate substantially from those in national ones, the question was whether their close proximity this time would change that. It might be argued that, if electoral trends and issues of European integration should ever matter in a national election, this was the moment. However, with hindsight, the effect seems to have been marginal. Firstly, the issues most important to Swedish voters differed significantly in the two elections (see Table 2). According to exit polls, voters in the EU election were primarily swayed in their choice of party by issues not traditionally positioned on the economic left-right scale, such as peace, the environment, democracy and gender equality. In the Riksdag election, however, material issues dominated, as usually is the case. The most important issues were education, health care, the economy and social welfare. Secondly, the respective results do little to suggest that the European election was of much significance for the outcome of the Riksdag election. Although the electoral results were similar in some cases, the overall patterns differ quite a lot. Most obviously, the Greens were far less successful in the national election. The small Feminist Initiative also failed to profit from its successful European election, in which it managed to win its first seat. Finally, although the Sweden Democrats made gains in both elections, there is much to suggest that both its successes were a result of a longer-term electoral change. Indeed, the Sweden Democrats have strengthened their electoral support consistently since the party’s formation. In 2004 the four centre-right parties entered a pre-electoral coalition, which they called the Alliance for Sweden. The main objective of this co-operative strategy was to overcome division within the “bourgeois” bloc, which hitherto had repeatedly undermined its parties’ collective credibility as a potential government (Aylott & Bolin 2007). With the win in 2006 and a second successful election victory in 2010, the Alliance changed the playing field. After eight years of office, seemingly without serious internal disputes, the Alliance’s record in office was perhaps its strongest card going in to the campaign. Many commentators argue that the Alliance accomplished a lot in its first term in office, but lost momentum during its second. The Moderates especially were accused of lacking vision and instead being more of an administrative body, doing little more than keeping an eye on the economy. Opinion polls also show that “ownership” of several issues, including most of those that the electorate prioritised, was lost by the Alliance to the centre-left during this second term. However, its main rival, the Social Democrats, also seem to be having problems. Although they were very critical of some of the Alliance’s most important reforms, particularly some of its tax cuts, they made it clear that most of them would not be reversed. Overall, then, we see a race to the middle ground. And while there are, of course, still differences between the two biggest parties, the general view seems to be these differences have decreased. One might legitimately raise the question of whether a change of government actually will lead to substantially different policies. Besides discussions of government formation, the most debated post-election issue was about the electoral surge of the Sweden Democrats. The party was founded in 1988 by people affiliated to openly racist movements. This background was previously thought to have contributed to the fact that the Sweden Democrats, unlike parties with similar agendas in other parts of Europe, had failed to win many votes. This millstone now seems to be less of a burden to the party. Since its inaugural election in 1988, the Sweden Democrats have virtually doubled their share of the vote in every election. In 2010 they finally managed to pass the threshold for representation in the Riksdag. However, due to their isolation by all the established parties, the Sweden Democrats were denied any influence, despite having acquired the balance of power position. Many theories as to why the Sweden Democrats did so well in this election have been suggested by political scientists, journalists and politicians. A few things seem to be undisputed, though. First, there is a large minority of Swedes who are sceptical towards their country’s generous immigration policies. By and large, these voters, if they prioritise this issue, have no other party to turn to. Exit polls also show that while immigration was a rather unimportant issue to voters in general, it was the most important one to those who voted for the Sweden Democrats. Second, the party has, over the years, grown not only electorally but also organizationally. Party membership and the number of its local organizations throughout the country have both risen markedly. The party does not only now present candidates for office in its strongholds in Southern Sweden, but also in the Northern parts that used to be blind spots. Such organizational proliferation is an important explanation for the electoral surge of radical right parties (Erlingsson et al. 2012). As early as election night, the prime minister, Fredrik Reinfeldt, acknowledged defeat and announced his resignation. During the campaign, the Alliance had pledged to leave the prerogative of government formation to the centre-left parties if they won more seats. However, with neither block holding a majority, and with a pariah party holding the balance of power, Löfven found himself needing to find allies from both political blocs. At the time of writing, Löfven looks neither willing nor able to produce a majority government. Quickly after the election, Löfven ruled out the Left Party as a coalition partner. Soon after that, however, his likeliest partners from the Alliance, the Liberals and the Centre Party, publicly declared they would not enter a Social-Democratic-led government. Left with only the Greens, the most likely outcome is a minority coalition government that holds less than 40% of the seats in parliament. Yet given the rules of the game that may not be Löfven’s biggest problem. The real test of his ability to govern the country may instead be when parliament decides on the state budget later this autumn. Although the centre-left trio is bigger than the Alliance, votes from the Sweden Democrats can tip the vote in favour of the centre-right. Since all the established parties agree to continue to uphold the parliamentary isolation of the Sweden Democrats, no negotiations with them will take place. Moreover, the Sweden Democrats’ leader, Jimmie Åkesson, has not revealed how they will vote, pledging only to vote for the bill that is “least damaging to Sweden”. While both sides repeatedly declare they will not let the Sweden Democrats influence policies, the debate about the budget certainly indicates that they have an impact on politics. Arguably, the political situation in Sweden is more complicated than it has been for some time. While the Alliance was able to govern from a minority position during the previous electoral term, this was partly due to the fact that the Sweden Democrats supported the government moe often than the opposition. If these voting patterns persist during the upcoming electoral term, the incoming government will hardly survive. In that case, a new government will have to take over. There has been speculation that an early election could be called, something that has not occurred in Sweden since 1958. Still, minority governments are nothing unusual in Sweden. Typically, the Social Democrats have led the country for much of the post-war period without holding a majority of seats. Maybe the only real new circumstance this time is that they will share that burden with another party. Niklas Bolin (niklas.bolin@miun.se, @NiklasBolin) is Senior lecturer in Political Science at the department of Social Sciences, Mid Sweden University. Nicholas Aylott (nicholas.aylott@sh.se, @nicholasaylott) is Senior lecturer (docent) in Political Science and research leader in the Centre for Baltic and East European Studies, Södertörn University. Few areas of political science enquiry have grown at such a pace as that of Euroscepticism. Beginning with the work of Taggart (1998), of this parish, a significant body of work has flourished all with the aim of seeking to understand opposition to European integration. The substantive academic literature that defines the parameters of the study of Euroscepticism (Taggart: 1998; Sitter: 2001; Szczerbiak and Taggart: 2004; Kopecky and Mudde: 2004; Flood and Usherwood: 2005; Hooghe and Marks: 2007) was all drafted in a time of relative stability in the EU economy and politics of individual member states. The events of the economic and financial crisis that have gripped the EU since 2008 (henceforth referred to as ‘the Eurocrisis’), however, has brought a new dimension to the contestation of European integration. It is my belief that this ‘Euroscepticism’ is different to what has preceded it, in that it argues not for the return of sovereignty to individual member states (as Sinn Féin do in Ireland) or for withdrawal (as UKIP do in the UK) but for substantial changes in the policy response of the EU to the Eurocrisis. As Cas Mudde has discussed, in a very succinct and incisive account, the study of Euroscepticism has hitherto focused on either the extent to which a political actor wishes to remove their state from the processes of European integration (what he labels ‘the Sussex School’) or the ideological motivations for opposing the EU project (what he labels ‘the North Carolina School’). Euroscepticism has thus been interpreted by scholars (and, to be fair, politicians as well) as a zero-sum game whereby all criticism of the EU institutions and agreed EU policy is viewed as Euroscepticism to a greater or lesser degree. The key word here is ‘agreed’. As EU policy is being formulated there is no doubting the deep divisions and angry confrontations between member state governments, Commission officials, relevant civil society members and MEPs. Once EU policy becomes agreed (meaning, the position of the most recalcitrant voice has been brought on board), the policy ostensibly reflects the general will of all political and policy actors participating in the process. The slow but steady expansion of participants in the EU policy formulation process to include MEPs and certain civil society actors – such as trade unionists, environmentalists and business organisations – lends further credence to the perception that Euroscepticism can be characterised as the politics of extremists who are challenging the European social and political mainstream. The Eurocrisis has radically affected the EU policy making process. What has emerged is a clear schism between the so-called prudent and solvent ‘Northern’ states and the supposedly feckless bankrupt ‘Southern’ states. This has fed into a clear policy divide with the ‘Northern’ states favouring cuts to government spending, tax increases, and economic liberalisation to stimulate exports and raise economic competitiveness. This policy has come to be known as ‘austerity’ and has been strongly advocated, principally by Germany but also states such as Finland and Slovakia. The ‘Southern’ states disagree strongly with this policy. Instead they argue for an expansionist monetary policy from the ECB, the loosening of EMU deficit rules and increased EU spending to stimulate economic growth. Greece, France and Italy have been at the forefront in arguing for these changes. While it is not the place of this post to argue the rights or wrongs of various economic policies (there is plenty of that here), what is important to note is there is a clear ideological split within the EU; a division that is driven, in part, by strong public opinion toward EU issues. When the EU policy making process was focused on extremely low salience issues – such as the system of CAP payments or tweaks to the Single Market – the public was simply not interested. Now that decisions at the EU level have direct and immediate impacts on their lives, citizens have started to care about European politics and their political interlocutors are responding by contesting EU economic and financial policies at the national and European levels. This is true for both the ‘North’ and the ‘South’. In the ‘North’ citizens are concerned that the EU is forcing through direct transfers of their money to irresponsible governments in the ‘South’ while their state services are being cut back. 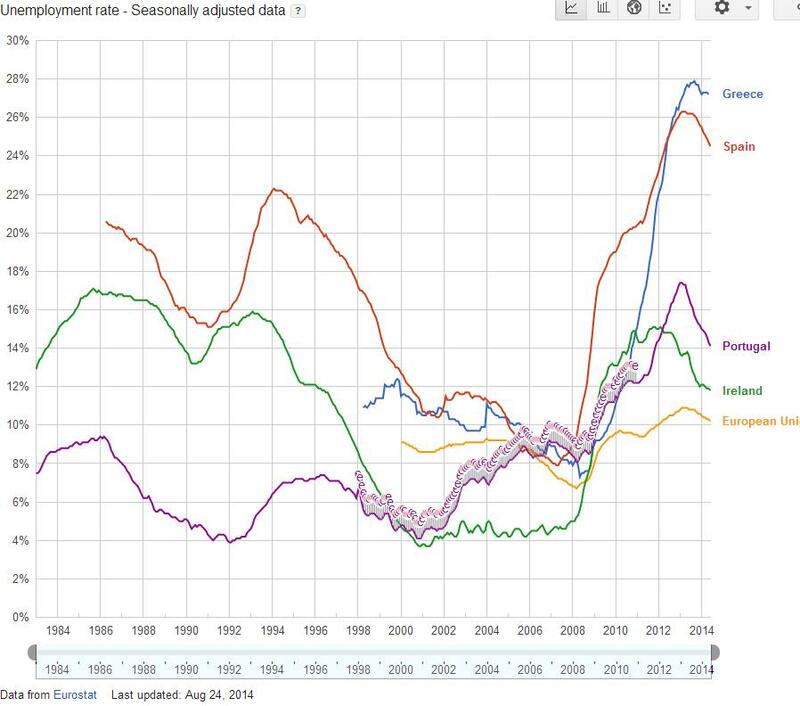 While those in the ‘South’ are incandescent at the imposition of austerity and the failures of EU institutions to alleviate their (as the graph below shows) eye-wateringly high unemployment rates. One would think that this would feed into outright rejection of the EU and the sweeping to power of Eurosceptic parties. As the Table below shows, public opinion, however, tells a different tale. 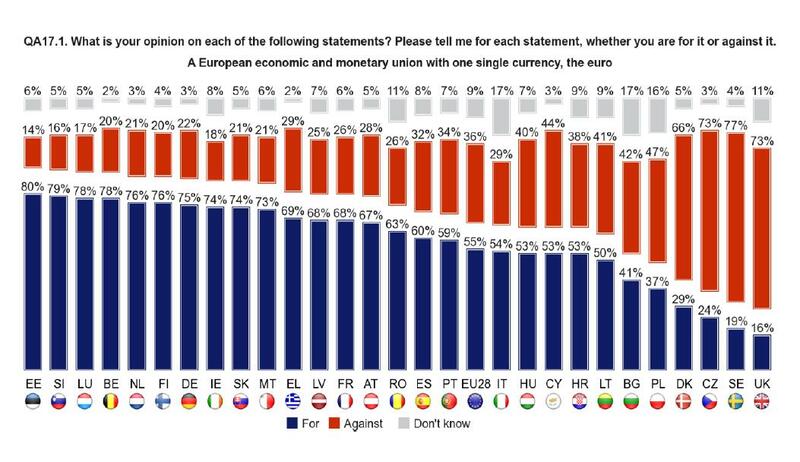 While citizens of the ‘South’ are deeply pessimistic about their current economic situation, they are still strongly supportive of membership of the Euro. I believe it is more correct to say that the EU is at a policy impasse rather than at risk of breaking up. Typically, such impasses are decided by elections with the winner implementing their policy on the basis of democratic legitimacy. At the EU level, however, there is no such means of resolving the clash between the ‘North’ and the ‘South’ via a direct democratic process. Citizens who believe that their state should be a member of the EU, but who disagree with the policies being pursued by the EU, have no means of changing those policies. The attempt of the Europarties to launch such a process with their ‘Spitzenkandidaten’, and argument that the outcome of EP elections needed to have an impact on the EU policy, shows that there is a degree of recognition that this needs to happen. As yet, though, the European Council and the ECB have been extremely reluctant to open up their policy making process to greater democratic accountability. The belief is that such a process is against the European spirit of conscociationalism and too much of a challenge to member state sovereignty and the independence of the ECB. They are too late. As Hooghe and Marks pointed out way back in 2007, in analysing the fallout from the Dutch and French No votes on the EU constitutional treaty, the politicisation genie is out of the EU bottle. The Eurocrisis has increased this process exponentially. For scholars of opposition to European integration it demands the development of a new system of analysis for Euroscepticism. There is a clear need to disaggregate those that are opposed outright to the principle of European integration from those who oppose the current ‘austerity’ economic policies of the EU but who support membership. Otherwise, we are left with an outdated categorisation that places the same label on the withdrawalist Dutch FPP of Geert Wilders as that of SYRIZA of Greece who want a radically reformed EMU. With the development of the Spitzenkandidaten and the emergence of different alternatives for what policies the EU should take to end the Eurocrisis, the term Euroscepticism needs to be joined by others such as ‘Euroreformist’, ‘Euroalternativist’, ‘Critical Europeanist’ for example. Scholars must keep up with the pace of change in the EU. In the past twenty years, most of the comparative literature has tried to demonstrate the existence of cross-national patterns of EU politicisation in the member states. It has been shown that radical parties tend to be Eurosceptical everywhere and the left has broadly emerged as slightly more pro-European than the right (although the opposite is true in some countries and in some other countries left and right tend to hold balanced views). What is the situation now, after so many steps have been taken to deepen and widen integration and after major external factors – above all, the economic crisis – have challenged the capacity of the EU to create gains for its member states? To address these questions, an original analysis was carried by a group of scholars in ten EU member states resulting in the publication of the edited collection Party Attitudes Towards the EU in the Member States. Parties for Europe, Parties against Europe (http://www.routledge.com/books/details/9780415622318/). The volume shows that the EU is increasingly politicised under the impact of national specific factors, hence it has become another face of domestic politics. Only rarely, does the EU represent a dimension of political contestation independent of the main issue dimensions at work in the member states. More often, country-specific factors, such as calculations for purposes of domestic party competition (including coalition-making, inter-party distancing or convergence, citizens’ attitudes and voter-targeting) and national economic interests (for example, net recipient countries tend to reduce opposition to the EU), prove very influential in shaping a space of contestation of the EU. Although with different intensities, parties in the South European member states are the keenest to delegate policy competencies to the EU, those in the new member states are reluctant towards most solutions that involve deeper integration, while party attitudes in other countries – such as France, Germany and Great Britain – are rather unique. Thus, evidence shows that the EU has gradually become embedded into the political scene of the member states and this could be considered an aspect of their Europeanisation. However, the presence of Europe in the national political space has not necessarily led to converge of the national party systems. On the contrary, as the politicisation of Europe largely follows national lines, we find attitude differentiation across countries that is dependent on the diversity of the national contexts, even more recently as the impact of the crisis has made the EU even more divided. For this reason, it becomes increasingly difficult to classify party attitudes toward the EU according to criteria that travel well across countries. Commonalities in those attitudes across countries have become rarer; a whole plethora of attitudes has actually emerged with parties choosing their favourite integration model from a rich European menu. It is difficult to find parties that reject the very idea of the EU process, this is a sign of how entrenched Europe has become within their repertoire. However, it is equally difficult to find Euro-federalists who advocate a deepening of integration in all fields: parties with a linear supportive stance are a minority; while the large majority is made of parties with a continuum of stances and whose support (or opposition) to the EU varies in intensity across the different aspects of the integration project. At the same time, the research that was carried out in the volume shows that a main common trait with respect to the politicisation of Europe concerns its level of salience. The EU issue displays greater salience where parties diverge, but lower salience where the EU constitutes a valence issue of involving either an optimistic or pessimistic approach. Indeed, the authors found that, not only did parties de-politicise Europe when they converge optimistically on the EU process, but also when they agreed on its negative qualities. In order to mark their distance from each other and to appeal to voters, parties mainly politicise those issues that they diverge on and the European issue is no exception to this. Again, this is a sign of that growing domestication of the EU issue that in the end tends to respond to the same rules of party competition as most other issues. The limited impact of parties on the EU institutional architecture and processes makes them unable to overturn EU decisions once in office. So, parties tend not to propose real alternatives to the current trajectory of the EU given that they would not be able to put them into effect anyway. Parties politicise issues and make them salient if they see electoral advantage in doing so, but beyond broad criticism, it is very difficult for parties to fulfill pledges that imply a change at the EU level. This can explain why, beyond the relevance of the EU in the life of the member states and of their citizens, it has proved difficult for parties to make Europe a salient issue for political competition. However, radical parties have now changed this tendency. These parties are not responsible for pledge fulfillment, as they are usually kept out of government, and this irresponsibility has allowed them to bring broad Euroscepticism to the centre of their discourse without being held accountable for this policy. This has made the Europe issue more salient overall. It is interesting to note that those parties that have made Europe a more salient issue are exactly those that oppose the EU the most. Under these circumstances, mainstream parties now have a possibility to demarcate themselves from the radical parties and to compete with them over the European issue that, as a consequence, could benefit in terms of increased salience. It is easy to predict, however, that greater salience of the EU issue in the member states will result in inward national competition more than in a genuine cross-national pattern of politicisation of the EU. Nicolò Conti (nicolo.conti@unitelma.it) is Associate professor of Political Science at the Unitelma Sapienza University of Rome and the editor of Party Attitudes Towards the EU in the Member States (Routledge, 2013).